Jackhammer aren't cheap to rent (I mean it's cheaper than buying for sure, but still...) and I sort of wish the price included some sort of Mary Poppins cleaning snap-your-fingers magic. The sad truth is where there is demo, there are giant messes. I'm a fan of recycling whenever possible to minimize the amount of clean up, because picking up demo cramps my impatient style. 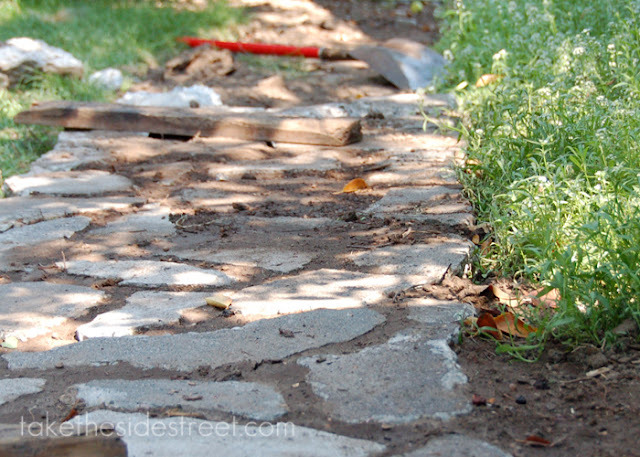 I had seen articles online about turning broken concrete into retaining walls in the garden and about recycling it into stepping stone pathways. 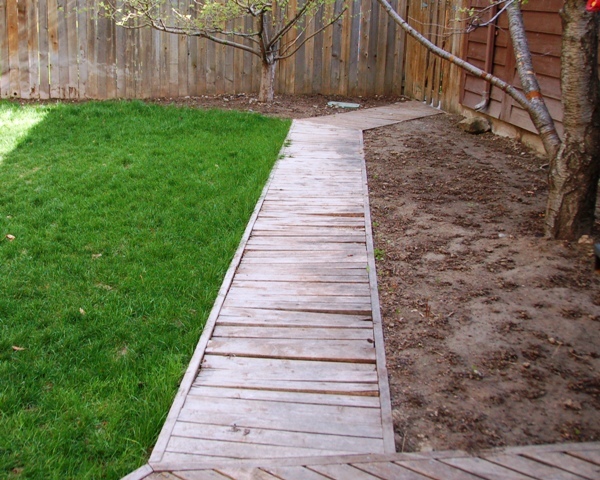 The second option seemed to be just what we were looking for, as the wooden walkway in our backyard has seen better days. As much fun as monthly tetanus shots are, it was time for something new! The entire pathway came apart really easily as it had been sitting in the dirt for years and was nice and rotten in places. I did, unfortunately, come across more slugs than any human should have to endure at once. I've been working on our new path for the last few days -- we're going away for this weekend so I'm not going to be able to finish it, but I wanted to give you a peek! I can't wait to see what it looks like when it's done -- and then to share it with you guys. I'm already loving its potential. Imagine little plants growing in the cracks next year. 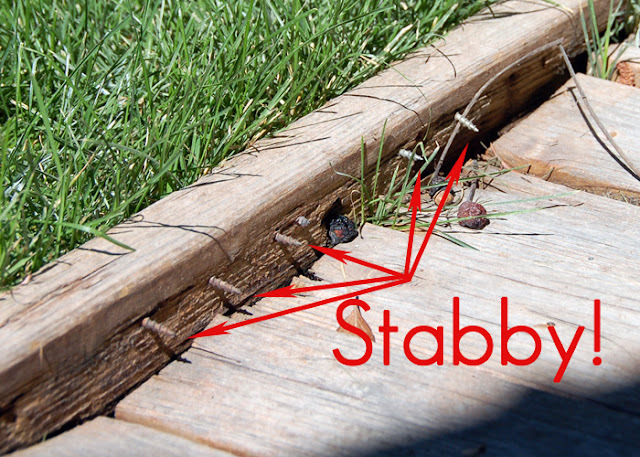 Imagine stubbed toes instead of stabbed toes. It'll be brilliant! what a horrid job! your man is awesome to do that and it will be so neat in the end. great idea! Cool! 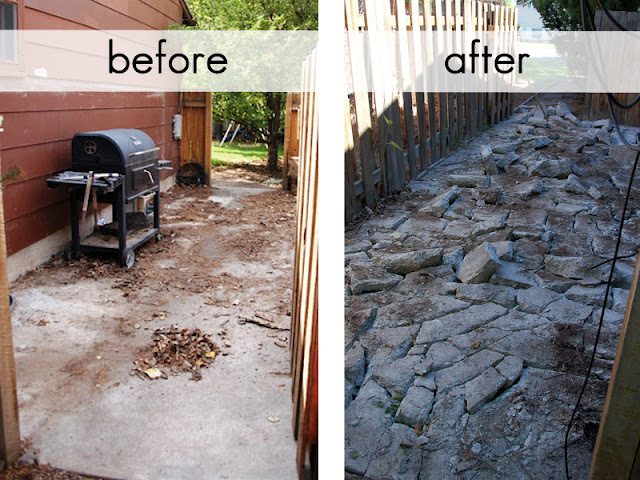 We are building a brick path out of reclaimed brick! http://goldengrasses.blogspot.com/2012/08/end-of-summer-projects.html(2nd picture)- can't wait to see what your walk way looks like!